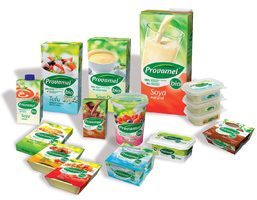 Provamel Soya Dessert is vegan and organic. It’s made by the same folks who make Alpro Soy Milk. A delicious dairy free chocolate flavoured dessert made with a blend of water and soya beans with added calcium and vitamins. Water, Raw cane sugar, Hulled soya beans (6%), Modified tapioca starch, Chocolate (1.8%), Cocoa powder (1.6%), Tri-calcium phosphate, Thickener: Carrageenan, Sea salt, Natural flavouring, Vitamins: Riboflavin and B12. The appearance is the first thing that you notice. It looks like those little pudding cups that you can buy in multi-packs at the supermarket. When you open it, which can be difficult if you get a very well-glued pull-top, you may need to mix it up a bit to get the creamy texture, as mine were a bit lumpy upon opening. I tried the chocolate, as that was always my favorite flavour of instant pudding. I must say that I was impressed to no end with the similarity of this healthy product to my over-processed, chemicalized pudding of yesteryear. So yummy! I have since sampled the vanilla flavour, and sadly it does not compare. The soy-ness of it is underwhelming. But the chocolate is tops! They have other flavours as well, mocha and toffee I believe. What must be said is that I gave up dairy because of the excess of unhealthy mucous that it caused when I ate it. 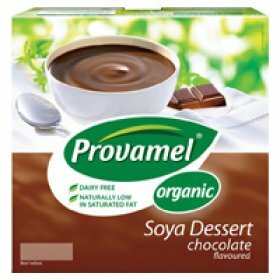 Provamel’s Soya Dessert causes the same effect for me, probably due to the thickeners more than anything else, but may not for you. My final vote: Good product for chocolate pudding lovers. Great healthy alternative for kids lunch boxes. Avoid if you have sinus reactions to dairy, food thickeners or soy products. I give it a 3.5 on a scale of 5. Try it out and decide for yourself.